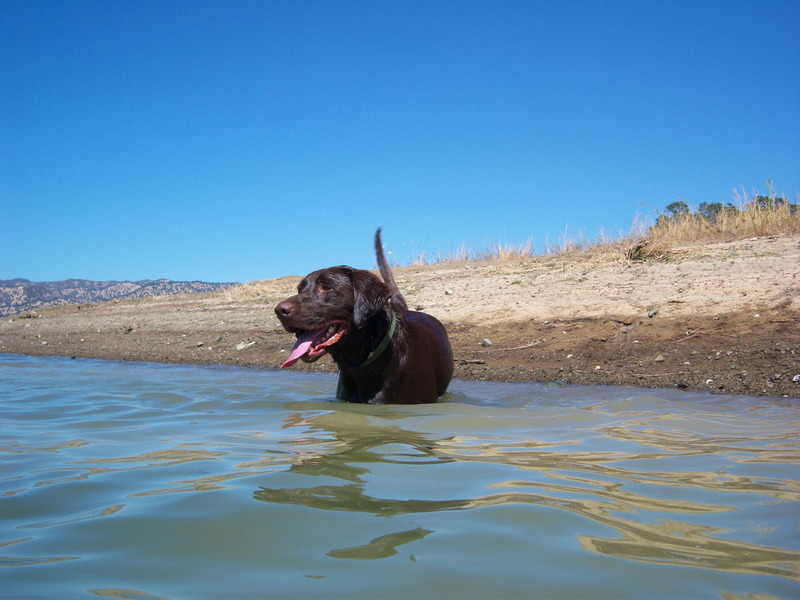 CoCo on the shore of Lake Berryessa. One of the best parts of my job at the winery is that when it’s not harvest we work a “four-ten” shift or 10 hours a day, four days a week. This means I get every Friday off, well at least until harvest. It’s pretty nice having a three day weekend every week. You get a whole extra day to take of all of life’s fun little errands like getting a haircut, going to the bank, the drug store etc. Last Friday, I was getting ready at the house with a long list of stuff to take care of, when I just stopped, looked over at my lab CoCo lounging on his bed and thought maybe I’d just hang out with the dog. 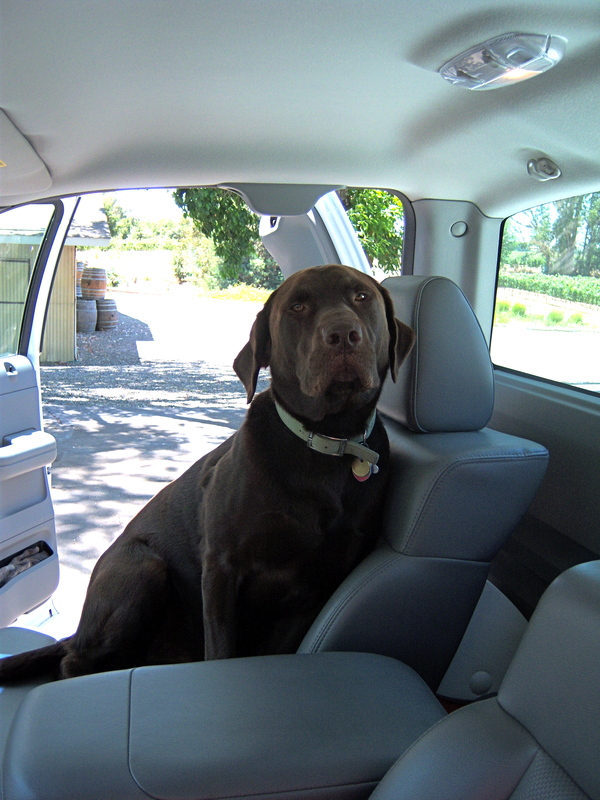 It had been a long time since I’d gone somewhere with CoCo and an even longer time since I’d been up to Lake Berryessa in northern Napa County so I grabbed a cooler, put CoCo in the truck and we were off to the lake. In the truck and ready to roll. With the windows down and blaring some country music, CoCo and I made our way up to the lake on the windy back roads. The day was pretty hot, so about 20 minutes before we got to the lake, I decided I better stop and pull over and see if I could get CoCo to drink some water. This resulted in a little bit of a panicked moment when the dog was able to slip off his leash and run out onto the highway but after a little scampering on my part I was able to catch him. The water at the lake was just perfect. Near the shore, the water had a slight greenish tint, but further off the bank it turned a deep turquoise blue. As it was a Friday afternoon, the lake wasn’t that crowded and CoCo and I were able to find a stretch of beach all to ourselves. 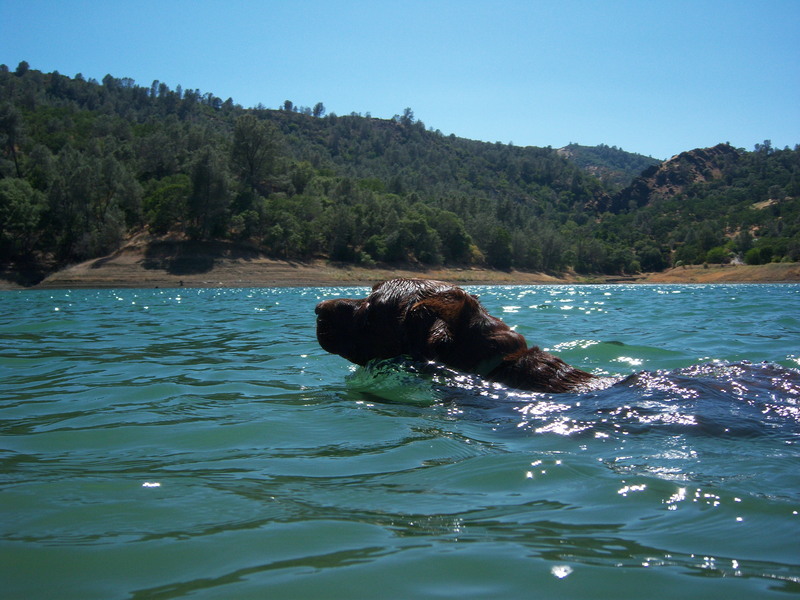 Many lakes can still be pretty cold this time of year, but Berryessa was in perfect swimming condition. You could just walk right in to the water that was still refreshing but not icy. Chugging away, while doing the appropriate style paddle. I’ve come to the conclusion that CoCo just needs to spend a week, or long weekend, at the water to really become familiar with it and with people swimming in it. But despite CoCo’s little behavioral quirks in the water, it still was a wonderful way to enjoy a Friday.